After a month dedicated to breaking down one of Springsteen's most famous albums, I needed a bit of a breather. With that in mind, I went back to the E Street Band, and dug out the debut album from Little Steven & the Disciples of Soul: Men Without Women. I had some trepidation going into this album: I was disappointed by Clarence's solo album, the promotional music video was incredibly goofy, and, I mean, just look at that cover. Little Stevie looks like a nerdy kid who just moved to a new school and decided to adopt a "tough guy" personality. Plus, the title Men Without Women invokes a feeling that this album will be an angered-fuel tirade against women who have done Steven Van Zandt wrong. In actuality, the title is a Hemingway reference, and the title track talks about how men act foolish without women. But the "Rory was wrong" theme doesn't end with simply the title. My doubt going into the album was immediately erased by the first song. "Lyin' In A Bed Of Fire" is the perfect song to kick off the album. We are immediately blasted with powerful drums, followed by a catchy guitar riff, and topped off by a blast of the horns section - all within the first 20 seconds. It's sets the template for what to expect from the rest of the album, as the guitar, horns, and percussion create the signature sound of Little Steven & the Disciples of Soul. 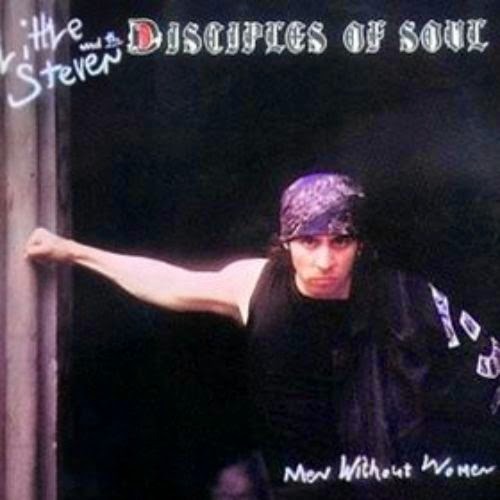 The lyrics tumble out of Little Steven one after another, reminding me of the Boss in his debut album. The album is full of passionate, catchy, horn-driven rock songs to the point where they do start to blend together a bit. However, Little Steven has frequently credited R&B and soul musicians from the 60s as big influences in his music, and that shines through in several songs, such as "Until The Good Is Gone". "Until The Good Is Gone" mixes both rock and soul, sounding like a mix of Springsteen's "Factory" and the Temptations' "I Wish It Would Rain". With Springsteen's raspy voice backing up Little Steven in the chorus, this song becomes an instant classic that I would love to see live. "I've Been Waiting", the last track on this album, is another attempt at blending the two genres, but is just too close to "Until The Good Is Gone" to really stand out. The true gem of this album is "Angel Eyes". Like "Lyin' In A Bed Of Fire", it is another uptempo rocker, but with catchier riff, a fantastic build right before the chorus, simpler lyrics, and backing vocals from Springsteen. It is easily the most memorable song on the album, and one that will stick with you from the first listen. After the first few listens, the tracks do blend together a bit, as there isn't that much range and experimentation. However, that's to be expected in many albums, especially a debut album. It all depends on how you digest music. If you are listening to the whole album, a song like "Save Me" might get lost in the mix; when pulled individually, you can better appreciate its strong lyrics ("As the things we need get closer, I feel the things we want slipping away."). I'd give it 4 out of 5 stars, and would highly recommend it to all Springsteen fans. If you are jones-ing for an E Street Band fix, and have been disappointed by the last three albums, go out and give this a listen. The only difficult part is actually finding this album. It is not available for a digital download as far as I can see. I purchased the Men Without Women/Voices of America two-pack (and yes, I plan to review Voices of America some time in the future). However, if you are really cheap and need this album, please reach out to us via Twitter or GMail and we'll try to help you out. Bruce Vs. Bruce - Springsteen versus the Hulk! Lyrics Spotlight - "Long Walk Home"